Today, the curtains came down on SQUASH WEEK at the Vicmead Hunt Club in Wilmington, Delaware. 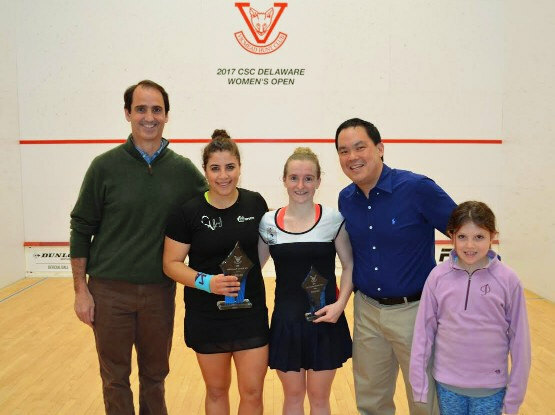 With a seventy person junior event wrapping up just before three in the afternoon, it was then the professionals to strut their stuff in the Final of the 2017 CSC Delaware Open. The two combatants, number one seed Kanzy El Defrawy of Egypt and number two seed Sarah Cardwell of Australia presented contrasting styles and demeanor. El Defrawy, the powerfully built, aggressive shot maker, against the diminutive Aussie but gritty and fast. On paper, you would expect a quick match in the Egyptian’s favor, but the Australian wasn’t about to hand it to her. She came out with the right game plan, trying to cut down El DeFrawy’s angles, and forcing her to reach down for most of her shots. This seem to catch El DeFrawy off guard as she quickly jumped out to a 4-1 lead in the first game. However, the relentlessness of El Defrawy’s game does take its toll so even when you are winning points you are constantly working. Even without her normal pizazz , El Defrawy still managed to work Cardwell hard. And this is what happened in the first game, with El Defrawy keeping it close enough that by the end of the games, she would force Cardwell into errors, or end up with a loose ball to put away. In the second and third games, it was more of the same, although Cardwell began to use the working boast more, with great effect which kept her in the games, but in the end Defrawy was just too strong for her. The Delaware title going to her in just over forty minutes for three games. Semi-final night at the CSC Delaware Open was a tale of two different styles. 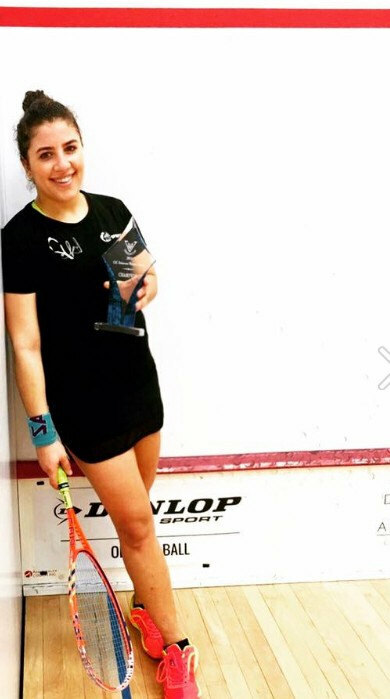 In the first semi-final between Kanzy El Defrawy of Egypt and Samantha Cornett of Canada, it was an all out slugfest, with both players hitting with pace and taking that ball early along with using their unbelieveable reach to get them out of trouble when their opponent sent them in the wrong direction. El Defrawy, who took just over fifteen minutes in her quarter final match, can certainly blast you off the court with her combination of shot making and power, and then there is Sam Cornett, with long strides seems to cover the entire court with barely two steps in either direction. In the first game El Defrawy was determined to try her blitz attack as she did the night before, which seem to be working for the first half of the game before Cornett started to find her length and extended the rallies. However the hole Cornett dug for herself was too steep and it ultimately ended with her serving out of court on game ball. Always the crowd favorite in Delaware, Cornett was not about to go down without a fight and so she came out in the second game really determined to extend the rallies and being patient long enough to see whether El Defrawy would make a bad decision. However, as she keep the score close, ther would always be a badly timed unforced error. The way El Defrawy plays, it sometimes forces you to aim a “milli inch” lower, just so you don’t give her enough room to attack, you could see Cornett going through these periods. However, she would recover with long excruiating rallies that seem to take some of the wind out of El Defrawy sails but not much. The game went to a tie breaker only to have a couple of badly timed errors on balls to the front court to help El Defrawy take a two game lead. The third game had everything as both players began to use all the weapons at their disposal, including a behind the back volley cut off by El DeFrawy which landed in the back corner nick. At that point you were beginning to wonder whether it was El Defrawy’s night as everything seemed to be going well for her. Credit the determination of Cornett for sticking with her game plan as she continued to use her pace with probing length to keep El Defrawy behind her which began to open up the front court more. Which would get her a run of points only for El Defrawy to creep her way back. This went on for the entire game until El Defrawy, feeling the effects of some long rallies couldn’t retrieve two excellently driven balls to the back corner, and so the match stood at 2-1 for El Defrawy. Could Cornett do a repeat of the night before? Unfortunately it was not meant to be as she began the fourth game with a flurry of unforced errors and El Defrawy never looked back as she ran away with the game and match winning the fourth 11-5 on a stroke. The second semi-final was an all Aussie affair ( Aussie ! Aussie! Aussie) between Sarah Cardwell and Tamika Saxby, who probably have been playing each other since juniors. They play the exact same grinding, gritty style and are excellent retrievers. They split the first two games and the see saw affair continued into the third and fourth games, with only a few unforced errors by Saxby at the back end of each game allowing Cardwell to steal those games. In between there were a lot of lenth hit to the back until someone spilled the ball out far enough for one of them to attack. A truly tight match which left the spectators on the edge of their seats not knowing what would happen. Tomorrow’s final will test whether Cardwell can withstand the Egyptian blitz attack that she probably knows is coming, and then just keep her on court long enough to start dictating the play on her own. If she doesn’t do that, it could be a very short day and we could all be home to watch the football games. What would it be without some drama at the CSC Delaware Open? Tonight, for the first time in its seven year history, all eight seeds playing in the quarter finals. 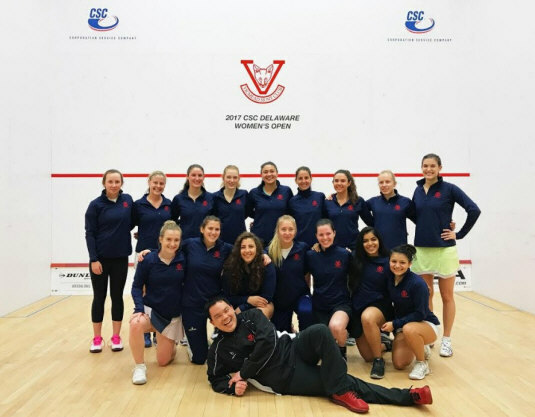 However, that nostalgic moment was very short lived, as in the second match of the evening, Sam Cornett would stamp her return to the tour with a gutsy comeback win from two love down to beat fellow Canadian Danielle Letourneau. The match started out with both players feeling each other out, long rallies followed by unforced errors. However, in the middle of the game it seemed that Letourneau, was getting the better of the exchanges and took a 10-7 lead, only to see Cornett walk it back to 10-10 before two more unforced errors by Cornett caused her to lose the first game 12-10. The second game saw more of the same, with Cornett struggling to find her length and even worst making unforced errors on her bread and butter short game. To Letourneau’s credit, she dispatched anything loose. However, there is a reason Cornett has been to the finals three times at this event, and yet again she showed her champion spirit as she came out in the third, and picked up the pace of the rallies, no longer allowing Letourneau to step in and cut off her drives and making the rallies longer. She reduced her forays to the front court and just used her pace and length to pin Letourneau back, only going short when she had her trapped in the back. The pace seem to be getting to Letourneau and she eventually lost that game 11-6. In the fourth Cornett came out and began making unforced errors as she continued to search for her deadly front court game, but recognized, that it probably wasn’t on tonight and began to do what she had done in the third, which worked brilliantly even though a few unforced errors towards the end of the fourth caused some heart palpitations in the crowd. By the fifth game, Cornett sticking with the plan this time, closed it out to cap a terrific comeback and advance to the semi-finals tomorrow evening against Kanzy El Defrawy. El Defrawy did not allow her opponent to even get to double digits in points. While she struggled with another French woman during Thursday’s night first round, tonight she was not in a very generous mood. Her ability to hit with pace along with a snappy wrist which makes it hard to read what the next shot will be, were all on show tonight. She never allowed her opponent to get into a rhythm, as the ball always seem to end up somewhere her opponent least expected it. She will be tough to beat if she continues to play at this high level. Tamika Saxby has quietly made it into the semi-finals with not too much fuss, and this can be deceptive as she continues her steady play, of willing to play the long points but not scared to attack the front cou, rt when the opportunity/ present itself. She also plays stellar defense. It will be interesting to see what she does tomorrow night against fellow Aussie Sarah Cardwell who had her hands full with Canadian Nikki Todd, for the first two games of the match. However after a close second game which she won to tie the score at one game all, Cardwell just upped the pace of play and Todd had no answer. So tomorrow’s semi-finals will see Cornett playing DeFrawy and then followed by the two Aussies Saxby and Cardwell. Contrasting semi-finals to say the least, as one will high light shot making, while the other is sure to highlight the retrieving aspect of the sport. After an exciting qualification round, Thursdays first round of the CSC Delaware Open went according to form. Actually the only surprise was the 55 degree weather (13 Celsius for you metric folks) in January. The top eight seeds advanced very comfortably with only Tamika Saxby and Nikki Todd being pushed to extra games. Saxby’s match with Nicole Bunyan of Canada, was an entertaining affair with both ladies showing off their exceptional athleticism with some amazing gets. However, after the first game which Saxby lost due to some loose width, she managed to bear down and take Bunyan in short, while tightening up her length. Only some unbelievable retrieving from Bunyan kept the score really close. The other match to go extra games was the matchup between Nikki Todd of Canada and Catalina Pelaez of Colombia, who are like Batman and Robin off the court, and have probably spent many hours training together on it. Surprising this was the first time they have met in a tournament, and they did not disappoint. The first game going to Pelaez 19-17, as for every tight volley drop Todd had, Pelaez had some misdirection shot which would catch Todd flatfooted. However, Todd was able to tighten up her game, and began to make Pelaez pay for any loose decisions, which worked in the end as it created more errors. Todd would go on the win it in four games. Vicmead’s own Julia Ward bowed out to Canada’s Danielle Letourneau, who was unwilling to allow Ward to get an momentum in the match, and she went down in three games. However, a great accomplishment from the future EPH. So the quarter-finals are set, and some of the match ups to watch, are the battle of the two Canadians, Sam Cornett and Danielle Letourneau. They have played twice this season and are tied at one win apiece. The Todd and Cardwell match should also present contrasting styles which should prove very entertaining for the crowd. Stay tuned, as we know that anything is possible at this event. of the CSC Delaware Open! Day one of the 2017 CSC Delaware Open got off to another great start, with some very competitive matches. The first match of the evening saw Brazilian Thaisa Serafini taking on Guyana’s Mary Fung-A-Fat. Serafini, playing her first tournament in nearly a year due to injury got off to a nervous start, as Fung-A-Fat used her lob and drop game to great effect. Fung-A-Fat took a close first game, cashing in on some lose balls from Serafini. However, in the next three games she used her athleticism to counter any of Fung-A-Fat’s forays into the front court, and even countering with her own shots at the front. She now moves on to play the eighth seed in the main draw Georgina Stoker of England. The second match between Enora Villard of France and Kelsey Engman of the USA, was a hard hitting affair, with the players displaying great power, really enjoying the unusually bouncy courts. However, Villard’s volleying and short game made to difference, as she cut any loose balls off and took it in short. Engman, to her credit did make a fight of it in the 3rd game but just game up short in trying to get back into the match. She will now play #1 seed Kanzy DeFrawy from Egypt. The next match of the night, featured the biggest upset of the night. Julia Ward, the 18 year old high school senior, who will be heading off to Williams College in the Fall, created a big upset when she defeated top qualifying seed Janet Vidhi from India in five grueling games. After a nervy first game , Ward settled down and begin to established her length and was able to get in front of her opponent using the whole court to make her opponent work. However, after squandering two game points in the third game to go up 2-1 in games, she came back in the fourth and fifth doing what she had done in the second and third games, hitting with pace and precision, and forcing her opponent into unforced errors. 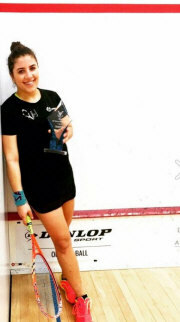 She will now play Danielle Letourneau of Canada who will present a huge challenge for her, given that Letourneau has a couple tour titles to her name. The final match between Catalina Pelaez of Colombia and another local junior Jen Cleary, was a three gamer with the tour veteran taking no mercy on the junior to advance to the main draw. She will play her good friend Nikki Todd of Canada. After an already fantastic first day, it will be interesting to see whether this will be another year full of surprises, especially with a very competitive field. In addition to last year’s runner-up, Nikki Todd, former champion Sam Cornett is back after a year off due to injury. The top seed is Kanzy El Defrawy, who after a stellar four year college career at Trinity is now playing the tour full time. Matches begin at 5:30pm for tomorrow’s first round.